The National Association of REALTORS® shows that single female buyers are one of the fastest growing homeownership demographics in the country. 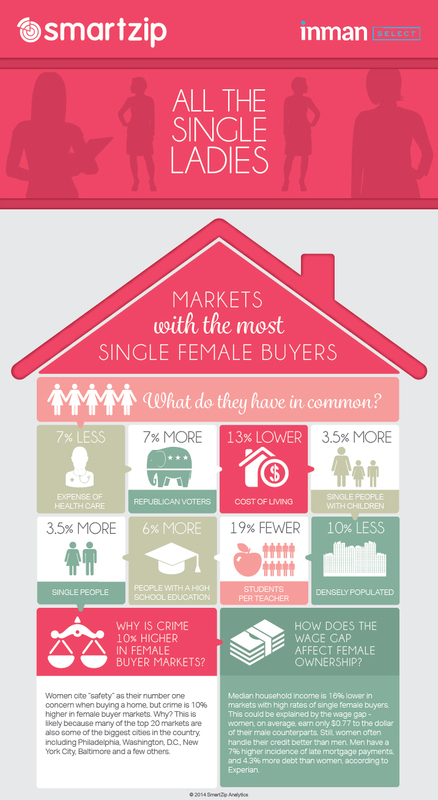 Where are the popular areas for single women to buy homes, and what do these markets have in common? Here, we dig into the characteristics of the cities with high numbers of single female home buyers. To recap quickly, markets with high numbers of female buyers have 7% lower health care costs, and a 13% lower cost of living. There are more single people in these female markets too - with and without children. Education stats are great in these female-centric markets, which show a 6% higher high school graduation rate and 19% fewer students per teacher than markets with more single male buyers. Interestingly, despite women being more likely to vote Democratic, the female buyer markets had 7% more Republican voters on average. First, despite crime being the number one concern of female home buyers, the markets with more female buyers had 10% higher crime rates on average. Why? Well, many of these markets are in the biggest cities in the country -- like Philadelphia, Washington, D.C., New York City and Baltimore -- which have higher rates of crime per capita than smaller cities and towns. Next, the median household income in female buyer markets is 16% lower than markets with high male ownership. This, unfortunately, can best be explained by the wage gap between men and women nationwide. Women earn just $.77 on the dollar to their male counterparts, so their buying power is also stunted in comparison. Interestingly, despite lower average pay, women often have better credit than men. According to Experian, men have a 7% higher rate of late mortgage payments than women, and 4.3% more debt.